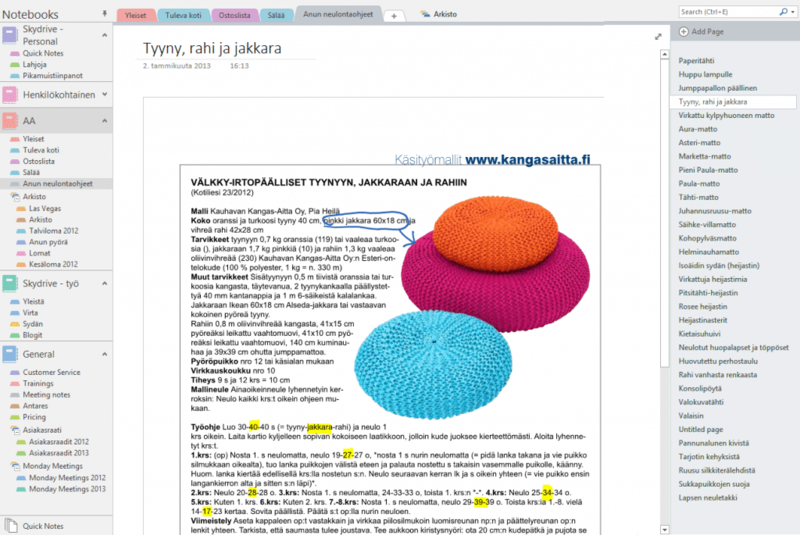 In this brief video, our Head of Training, Anu Nevalainen, demonstrates, how you can use Microsoft OneNote to write down and share meeting minutes. It’s really easy to sync your notes between OneNote and Outlook. Does it sometimes feel like you’re working a lot, yet you can’t get anything done? Don’t worry, you most certainly are not alone. I also used to suffer from a sickness I like to call serious multitasking. It’s quite closely related to the lack of concentration, idling and running aimlessly. I’ve come to the conclusion that serious multitasking seems to be on the increase, because for one information worker there simply are too many things to do and follow simultaneously. Regarding work and especially results, serious multitasking is destructive, as the most serious symptom of serious multitasking is that nothing ever seems to be completed. This leads to an unhappy circle of events: when you can’t score off anything from your To-Do list, you won’t get the experiences of success, which eventually leads to decrease in motivation. Luckily there’s a cure for this disease. I started my healing process immediately after joining Cloudriven. Although some of the symptoms still apper from time to time, I feel relieved and – most importantly – I can score off tasks from my To-Do list every week. For people suffering from a serious case of multitasking, I recommend the following three point treatment. Our CEO Jukka has said that change can’t be managed over a weekend. If actions are not monitored weekly, temptation to procrastinate is way too big. Loose and long deadlines tend to make us passive, because by nature we underestimate the time that is needed to perform a task. On a weekly basis it’s also easy to confirm, that we all are doing right and meaningful things that support the shared goals. At Cloudriven we naturally have certain strategic goals and metrics. Instead of monitoring the metrics once a quartal or a year, we keep track of the metrics weekly by using our own Habit designed for performance management. This way we can react fast to changes and our employees’ motivation and engagement will stay high, because we can concretely see that our actions have consequences. Our actions have a direct effect on the strategic metrics of the company. The five day work week is surprisingly short, whereas a year feels like a lifetime. Yet, there are only 52 weeks in a year and at least four of those the worker spends on holiday. In average there are approximately 47 work weeks in a calendar year. We’ve come to the conclusion that you should only concentrate on three things per week. That is why we promise in our Monday meeting to finish three tasks. The amount of tasks might sound small but in addition each of us has also other work-related responsibilities which take time. The trickiest part is to choose tasks of the right size: if you’re too greedy, time runs out. Thanks to our management system, I’ve developed a clear understanding of what I can achieve during one work week. This makes personal time management a lot easier. 47 weeks x 3 tasks = 141 accomplished tasks in a year. Serious multitasking doesn’t bring you these kinds of figures! Every Monday in our weekly “laputus” meeting (laputus is Finnish and means the act of sticking notes on a wall) we go through the tasks of last and beginning week. Positive social pressure is created, when everyone can briefly report about their doings. It’s always nicer to tell about achievements than explain away why you haven’t been able to finish the tasks. We write the three tasks down on Post-It notes and we return to them next Monday. We also follow the tasks in our own Habit. You get points for every accomplished Post-It note and it’s easy to check from the results view, how many have reached their weekly target. To make a point of giving points, you can buy small prizes (for example, a bottle of sparkling) from the Habit point store. We report and monitor strategic metrics in Habit on a weekly basis. In Habit, positive social pressure is being created with an encouraging competition. You get points for accomplishing tasks. You can buy small prizes from the point store. So seriously, stop multitasking and start achieving! We’d be glad to tell you more tips about increasing your own and your team’s productivity. Leave your e-mail address and we’ll offer you FREE first aid for the most acute emergency. It’s so normal for me to use SharePoint that when I start in any team or project I have a need to get SharePoint team sites into use. The latest example is me getting into the board of trustees of society for the prevention of cruelty to animals last year. I tried to keep up with all the e-mail conversations and attachments, but was soon dreaming about SharePoint. There we could save all the necessary files from meeting invites and minutes to pet foster home agreements. It would be so much easier to use discussion board instead of a lot of e-mails, create a calendar where all the board meetings and events are marked, manage a to-do list, pet foster home list, list of all the animals that our society is taking care of and the list goes on. As a new board member I didn’t have any means to read previous e-mail discussions whereas discussion board in SharePoint would have offered me also all the past discussions as well. A need before that is dated a little over a year back when we purchased a house that needed a massive renovation. All of the sudden we were in a situation where we needed to plan the timetable, budget, look at the pictures, graphs, floor plan, contractors contact information and download files of the renovation project. 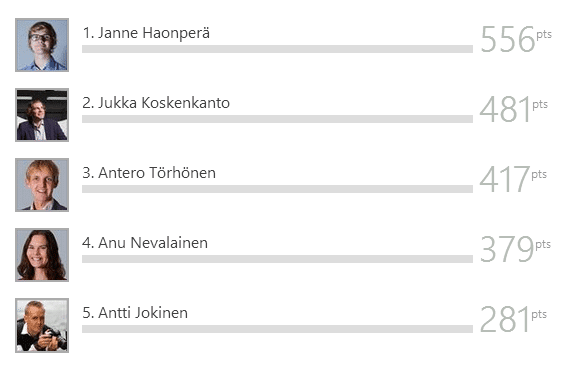 My partner understood to use a SharePoint team site for the project and now all the needed files, pictures, timetable and budget are saved there as well as next tasks in prioritized order and several contact information. My favorite child in business world is the team site that I designed for managing trainings. 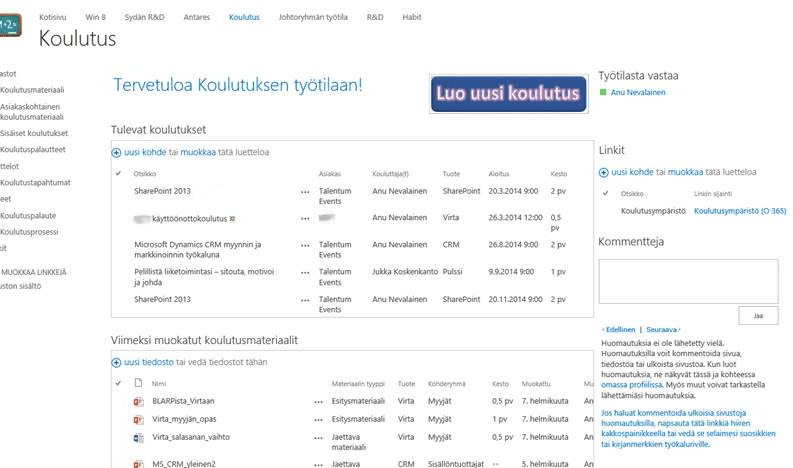 The first picture shows the original team site designed for SharePoint 2010. I didn’t create the whole in one session, but I have added features little by little when needs occur. This in my opinion is the key factor in designing team sites: first one needs to figure out the needs – why is the team site needed, what could it be used for, what’s the challenge that is set out to solve. I myself had two main challenges which I wanted to tackle with the training team site: where can one find the needed training material and where have I been sold to train (when, where, what, who?). The first challenge was easily solved. I created a library where I downloaded all the existing training materials (nearly one hundred files). I thought carefully what information do I need of each file and what would be the easiest way to find the right material. This lead to noteworthy amount of different columns, i.e. metadata, and the front page only shows the most important ones. Now if I need to find a certain material, I find it with just a few filtering clicks on the columns. 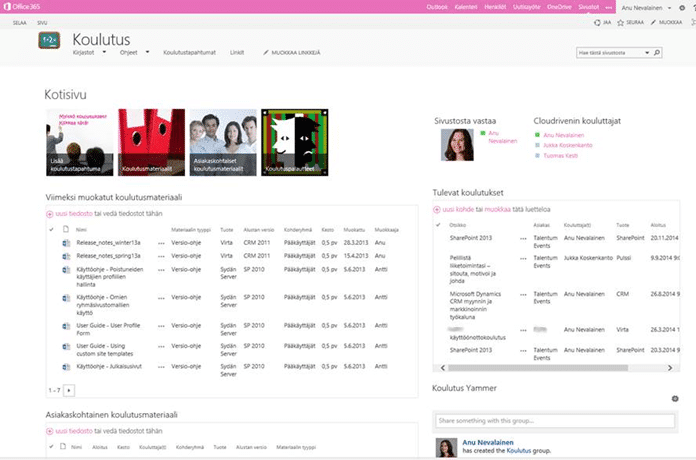 Later on I created a library for customer-tailored material and one for our organizations internal training material. Sure all these could be saved in one library as specific content types. Separate libraries make it possible to create different user rights for the libraries and share something in the extranet in the future. I wouldn’t want to share our internal training material for everybody! The other challenge was a bit harder. How do I make the sales people to use my team site and write down the sold/agreed trainings there? Technically it wasn’t a big challenge. I created a custom list in the site and created just the columns/fields that were needed when I go to a training (for example who was the sales person, what are the names of the customer and the contact person, what’s the address etc.). It was just that the button “Add new item” was not so noticeable so the usability in the eyes of the sales people wasn’t so good. I came up with the solution to add a big button “Add new training” in the front page and copied the hyperlink from “Add new item”. That way the big button opens a new create item form. All I had to do was to explain to the sales people that you need to click on the big button and fill out the form. For finishing touch I created a workflow for the training calendar that sends an e-mail to the assigned trainer every time someone edits a field in that list. This way neither me nor any other trainer has to check the site every once in a while; the info in the form is delivered directly in one’s inbox. Taking possible newbie trainers into account I added a page where the entire training process from selling the training into analyzing the feedback is explained thoroughly. I created that schema with MS Visio. This way even the ones who train seldom remember to do the necessary things before and after training. Later on I added one more metadata to the training material library, link list, information about the contact person of the site (that’s me of course), commenting feature etc. Even Rome wasn’t built in a day. I just finished updating my training team site into SharePoint 2013 era. The whole idea of the team site was created for SharePoint 2010 so it was a bit outdated. The last spark to do this were the tips given by well-known WonderLaura and Jennifer Ann Mason at the Las Vegas SharePoint conference. As you compare the pictures of the team site in SharePoint 2010 and SharePoint 2013 you may notice that I added some visual elements in the front page with picture links, changed the layout to Oslo (left navigation is up so more room for content) and changed the commenting feature into Yammer-feed of training group. What do you think of the changes? P.S. You’ll never guess how fast it was to get the number of trainings held last year for my boss! How to Use OneNote Effectively? In my last blog post I tried to inspire readers to take Microsoft OneNote into use by revealing shortly about it’s good qualities and user-friendliness. Now I thought I’d give some concrete examples on how to use OneNote and tell you what I use it for all the time. I use four different OneNote files: work-related company’s file (location: SharePoint intranet), work-related personal OneNote (location: my own work SkyDrive), home-related family’s file (location: my partner’s SkyDrive) and home-related personal (location: my personal SkyDrive). I’ll illustrate the possible use cases of all these four and hopefully you can pick at least some ideas to use yourself. My OneNote is a true treasure chest. In my organization’s OneNote it is easy to write customer meeting minutes, matters agreed in internal meetings and issues raised in our customer events. This way everyone in the organization can find information on the subjects discussed and agreed in one place; each meeting and event has it’s own page. Customer meeting minutes are quick to send to the customer even before you leave the meeting room by pressing Email Page. Minutes are always in order and presentable; it’s very rare that customers demand official meeting minutes with hanging indent. The notes I take usually include OneNote’s graphic tags for questions that remain unanswered, issues that were extremely important and/or next tasks of a project in prioritized order. After the project meeting each member of the team can mark themselves the tasks that are assigned to them as Outlook tasks by pressing just one button. That makes the tasks visible in the team member’s own Outlook. Keep your notes in order by using the pages and tabs in OneNote. My own work-related OneNote is constantly docked to desktop. There I have written for example those computer names that I need often so that I can see them at a glance and can copy addresses if needed. I also use OneNote to write down all work-related important notes instead of using sticky notes on the table which get easily lost. I also draft these blog posts in OneNote before publishing. The family-OneNote is in active use during our leisure time. We use it to write down for example shopping lists which are particularly handy to use in mobile phones. You can add the things you need from the grocery store to the list during the day or week and you can easily organize them for example based on the item’s location on the store. You just have to remember to update the mobile view before the cash counter in case someone has made changes to the shopping list during your time in the store; mobile interface doesn’t yet update the information automatically. We’ve also written our friends’ addresses to OneNote so that they are easy to find when travelling. When planning a trip we send web pages containing additional information about the destination and maps directly from the browser into OneNote. We also scan copies of our passports and flight tickets into OneNote. By doing this we can read those “web pages” offline when we’re on the road; there’s no need to print anything or use expensive Internet connections abroad. OneNote is suitable for other planning needs as well. When you need to purchase something, try sending web pages containing for example nice couches directly to OneNote instead of saving them locally in your browser’s bookmarks. That makes browsing and comparing products a lot easier and faster. My personal OneNote is a true treasure chest. I send there for example recipes I find in the Internet and also handwork and craft instructions. On one page I keep track of all my loved ones’ presents: what has been given to whom and what future ideas I might have. I also keep track of magazines I’ve ordered: are they long term subscriptions, when does the subscription end and so on. Before OneNote all these things were based on my own memory and/or sticky notes that eventually were lost. Use colors and drawings to highlight the most important parts of the text. You can also add images to the notes. As you can hopefully see OneNote is useful both at work and leisure. You should keep the application open in your computer all the time to get the most out of it; otherwise it’s nearly all the same if you use Notepad or OneNote to write notes. And using your mobile OneNote also pays off: all your grocery lists, checklists and meeting minutes are always at hand. My use case list is far from complete so if you have some good tips, please comment below or contact me! I’ll be more than happy to hear new ideas on how to use OneNote. https://www.cloudriven.fi/wp-content/uploads/2017/03/cloudriven_logo_white300x192-300x192.png 0 0 Sami Eklund https://www.cloudriven.fi/wp-content/uploads/2017/03/cloudriven_logo_white300x192-300x192.png Sami Eklund2013-07-31 10:00:342013-11-22 13:27:11How to Use OneNote Effectively? Microsoft OneNote − I’m Nuts About It! Almost everyone involved with rollouts know how hard it sometimes is to change organization’s working culture. I’m myself an active user of Microsoft OneNote; the program is constantly open and I use it both at work and at home. Even this blog post was first written in OneNote. Yet it still sometimes feels like I’m talking to walls when I try to make my collegues to understand how excellent OneNote is and get them to use it. On the other hand, I remember when OneNote was introduced to me and I still persistently used Notepad and other programs instead for quite a while. I gathered here some of OneNote features I find priceless in the hope of this ingenious program helping other people’s lives as well. OneNote is a combination of user-friendliness and versatility. The first mind-opening realization about Microsoft OneNote was that you don’t have to save the content separately, but all is saved automatically! Even if you try real hard to remember to save for example Office document, it is easily forgotten at some point and if some time has passed from the last autosave, then it really is frustrating to write all the things again if the program crashes. Another feature worth mentioning is speed! No longer waiting every document or other file to open or constantly searching for files from multiple places before you can even consider of opening it. In OneNote all the notebooks with sections and pages are visible on the side of the program so moving from section or page to another is really fast and easy. Third special feature in Microsoft OneNote is genuine collaborative use. Sure Office Web Apps make it possible to edit word processing files at the same time, but it is not possible to edit the same chapter at the same time. That makes it impossible to write for example meeting minutes simultaneously. 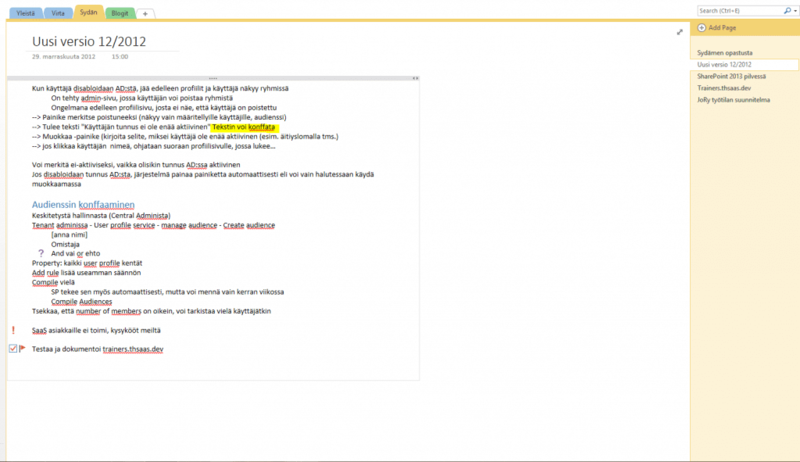 OneNote allows several users to write simultaneously in the same section and all users’ displays are automatically updated in the background. There is not much delay when you already see updates of the other user. Unfortunately, the automatic updates don’t yet work in mobile use. OneNote is a combination of user-friendliness and versatility. Previously I used to write quick notes in for example Notepad, but the editing possibilities of Notepad are almost zero. It is just as easy and fast to write notes to OneNote and there is a right amount of editing tools as well. The application works great with touchscreen devices and you can write notes also with touchscreen’s pen and tablet computer. You can even anchor the content of a page to the side of your screen. That way you can see your text, images and other content all the time even though you might want to change the application open in the bigger part of you screen. You can share your products via Outlook to you collegues or send notes in an e-mail to a customer. Outlook integration works smoothly and sensibly. Page layout options are close to nothing so official minutes or text requiring hanging indents is hard to produce. But as long as you keep the limitations in mind, Microsoft OneNote is a great tool for notes, memos, task lists, saving web pages, lists, etc. If one application is a little big program, it is OneNote. And how poorly known and overlooked it is! It is easy, fast and saves data automatically. What else can you wish for in an application? https://www.cloudriven.fi/wp-content/uploads/2017/03/cloudriven_logo_white300x192-300x192.png 0 0 Sami Eklund https://www.cloudriven.fi/wp-content/uploads/2017/03/cloudriven_logo_white300x192-300x192.png Sami Eklund2013-07-17 16:27:402013-11-22 13:21:11Microsoft OneNote − I'm Nuts About It!